As it turned out, Ellie didn’t have even one day in preparation for her talk with Reid. When her father pulled into the driveway, a black convertible sat in front of the garage. “Oh no! Ellie, Reid’s here. I didn’t know he was coming, I promise.” Stella looked panicked. Reid jogged over to the truck, opened Stella’s door, pulled her out, and threw his arms around her. “Hey, baby. I’ve missed you.” He buried his face in her neck. “I’m so sorry,” Ellie heard him whisper. Stella was hugging him back. Then their arms loosened and he was kissing her. Ellie looked away. Should she just wait in the car or get out the other door since her side was blocked by their bodies? She started to scoot to the other side when her door opened. “Hi Ellie,” Reid held out a hand for her. She took it and he helped her out of the truck. “I, um, guess we need to talk.” She nodded. Stella was climbing the front steps to the porch. She looked over her shoulder once before she opened the screen door and walked inside the house. Would this day never end? Ellie was exhausted from the full day, probably the busiest she’d had since she came home. She limped toward the porch, her leg was screaming at her, and stumbled when it buckled beneath her. Reid caught her before she hit the ground, then picked her up and carried her to the porch. Her face burned with embarrassment. She hoped Stella couldn’t see them right now. She’d imagine all sorts of inappropriate things. “Thank you,” Ellie said when he set her feet on the porch. “Can we do it out here?” That sounded wrong. “Talk, I mean.” C’mon Ellie, pull it together. Ellie wondered if that would still be the case in about nine months. “It’s a beauty.” Ellie pointed him in the direction of the barn. She figured it would be as non-romantic a place as possible and she didn’t want to be in the car while they talked. He followed the dirt road around to the barn. “Just park here, it’s fine,” she said. “All right.” He did as she suggested. He had to help her out of the car, though. Her leg wouldn’t cooperate. “Do you want me to carry you in?” She bit down on her lip, trying to decide whether she’d make it on her own. He scooped her up and started walking. Could she just sleep out here so he wouldn’t have to touch her any more after they talked? Why was her own body betraying her? She rubbed her thigh and winced. “It’s doing better every day. But today I’ve been on it too much.” She sat on a hay bale and rubbed her way down to the ankle. She was stalling. How was she going to do this? He finally sat down beside her. “Ellie, I’m really, really sorry I betrayed you by reading your journals. It was a despicable thing to do to you.” He leaned forward, elbows on knees and hands clasped in front of him. She’d been staring at him while he spoke. It was strange seeing him in the world she grew up in. He seemed very out-of-place in his dress shirt and slacks sitting on a hay bale inside an old barn. Still handsome, though. And he still smelled fantastic. No,” she whispered. A lie, because the truth would’ve ripped them all apart. Reid’s eyes seemed to grow in size until Ellie realized he was leaning toward her. Slowly, waiting to judge her reaction. If she did nothing, she could picture it all happening. The kiss, the first one, the next one. The ones that would make her forget everything she thought she knew about herself. If things had been different, if he hadn’t been in love with her best friend, would there have been any chance with him? It was there for a moment, this alternate life. Unconsciously she’d been moving just as slowly away from him; her head and shoulders bumped the wall behind her. What about her own morals? Did she believe some things were wrong, like kissing a married man, or was everything all right if it was what your heart wanted? Her hand came up. Her hand against his chest. A little pressure. It didn’t take much. He stopped. Waited a few long seconds to see if she would change her mind. And turned away. Maybe Reid was a great man for Stella, but he was definitely the wrong man for her. She’d made her decision. The rightness of it flooded through her. It swallowed up the little bit of regret that tried to surface. Drowned it until it was gone. Forever. “Yes.” What did that last part mean? He picked her up and hurried back to the car. They drove back to the house. He carried her inside and up the stairs while she gave him directions to the guest room where Stella was staying. She knocked lightly. “Come in,” they heard Stella say. She pushed the door open. Ellie didn’t feel quite right. The air, the room, everything seemed to be receding into the distance rapidly. Her eyelids drooped. She couldn’t fight it so she didn’t. “Are you sure, honey? Do you want me to bring you something to eat or drink?” Her mother was still worried. “Well, we were thinking maybe we would leave tonight,” Stella answered. “You’re mad at me for testing you like that,” Stella said. “Aw crap, there goes my special way of telling him,” Stella grumbled. “Calm down, Daddy, she’s getting to it,” Ellie said. “Yeah, I’m getting there! I had this whole plan on how I was going to tell you, but at least I can still surprise you with the twin thing.” Stella clapped a hand over her mouth. “She did not just say twins, did she?” Reid sat down on the bed. “Well, you were just in the hospital for several hours,” Ellie added. “You were in the HOSPITAL today?” Reid’s face was turning an alarming shade of red. “I think you’d better start from the beginning and tell him everything.” Ellie said. So Stella did. With Ellie filling things in whenever Stella forgot something. Ellie’d had enough when they started kissing. “You guys should get a room,” she muttered. “Oh wait, I think I’m still in your room. I’ll just go then.” She got up to leave and barely made it to the door before Reid caught up to her. “I don’t think you’re quite ready to be on your own just yet.” He wrapped an arm around her waist and they limped along like that for about three steps before he whipped her up into his arms again. “Your mom forgot your water,” he said, setting her on her bed. “I think you need to ask Stella about it. She told me to try to kiss you. When your wife tells you to kiss another woman, you just do it, okay?” He was trying to be funny. “But you can’t say that for sure.” He didn’t respond and in the ensuing silence she heard footsteps on the stairs. She held a finger to her lips to silence him. “Yes, please. I’d like to see you guys off.” He nodded and disappeared. “You okay, sweetie?” Her mom handed her the glass of water. Ellie thought about it for a moment. Wasn’t forgiveness an act of the will? Hard to do, but easier than trying to forget it ever happened. Stella waited, eyes pleading. “Yes,” she finally answered. Stella waved as she walked out the door. Ellie listened as she hurried down the steps, heard the screen door slap shut, and then the sound of the tires on the gravel as they drove away. They were finally gone and she was relieved. Now she needed to put Misty outside again. After she rested for a few more minutes. She closed her eyes. It was pitch black when she woke up and she needed to use the bathroom. She flipped the blankets off, thanking her mother for them, and glanced at her alarm clock. It was just after three in the morning. In many ways it made perfect sense. Light flashed across her closed eyelids and she heard a muffled sound immediately afterward. She opened her eyes. What had she just been thinking about? She blinked, trying to remember. Her husband rolled over, facing away from her. She thanked the Good Lord above that he no longer snored. A miracle if there ever was one. Lightning flashed and thunder rumbled, gathering strength and momentum until the house shook, the windows rattling in their panes. The bed trembled beneath her. A transformer box out on the curb near their window exploded in a shower of sparks, drawing her attention outside. The street lights winked out. She barely heard a thing. Frowning, she reached up, pulling on her ears to try to get them to pop. They must be stopped up for her hearing to be so poor. She stuck her fingers in her ears and wiggled. She yawned and moved her jaw from side to side. Nothing seemed to help. Maybe she’d have to go see Doc in the morning. Lightning flickered outside like a child playing with the light switch. She wasn’t scared, particularly, but in between the flashes it was pitch black in the room and she wasn’t used to it anymore. Of course, she’d grown up on the farm without street lights. Many a day she’d had to visit the outhouse in the black of night. But that was before she married Charlie and he whisked her away to Springfleld. She yawned again and turned to her side. On the bedside table sat a portrait of an elderly man and woman surrounded by younger men, women, and children. She didn’t recognize them. The furniture looked familiar though. And the patchwork quilt covering her. She rolled onto her back again. Memories stirred and fled with the lightning bolts outside her window. They must be visiting Charlie’s parents, she decided. They often stopped there when they traveled, and their anniversary was coming up. An important one too. Was it their first? No, they had their two boys already didn’t they? Yes, Chuck and Roger. And Mildred. Right. Three kids. Maybe it was their fifth anniversary. Charlie loved to surprise her. Where would he take her this time? She hoped they’d leave before the kids woke up. She hated saying goodbye to them. Tears formed in her eyes, just thinking about it. She reached up to brush them away and froze as the strobing lights revealed withered, knobby, and trembling hands covered with age spots. Mesmerized in horror, she wiggled her fingers, wincing as pain echoed her movements. She brought one hand up to her face to feel the soft, wrinkled skin across her cheekbones. The faded quilt lifted like a wave rolling beneath lily pads. Charlie reached out and pulled her to his thin, bony chest. She relaxed against him. When had he lost so much weight? “Thank you, Charlie.” She kissed his cheek. “How long are we staying at your parents’ house? And which anniversary is coming up? I’m so tired I can’t think straight.” Draping one arm across him, she snuggled closer. Charlie was getting downright scrawny. She needed to bake him some pies or something. He didn’t answer, just stroked her hair. She let him do that for a few moments, then raised her head so she could look at him. 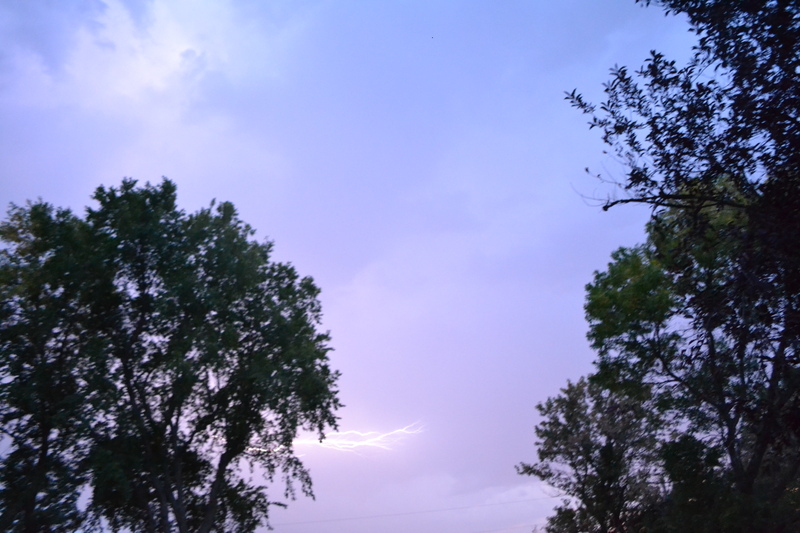 But the storm was blowing over; the lightning came more infrequently. She couldn’t see him so she reached up and touched his face. His chest quivered and a sob broke from his lips. He said something she couldn’t hear. She shook her head. She was still dreaming; still stuck in this nightmare. In many ways it made perfect sense.